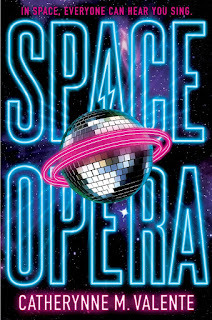 As soon as I heard about Catherynne Valente's latest book, Space Opera, I decided it wasn't for me. After all, I had never watched a single Eurovision performance and that's what this was billed as -- Eurovision in space. But then I started seeing the reviews that she was retweeting on Twitter and they said things about Douglas Adams and Terry Pratchett and laughing and loving and, well, I gave in and grabbed the last copy at my local indie bookstore (which was a good thing since it's out of stock in many places and already on its sixth printing!). Then I started hearing even more amazing things about the audiobook, read by Valente's partner, actor Heath Miller, and so I promptly put in a hold for that at the library. I ended up doing the entire thing on audio but am glad I have the hardcover to put on my shelf because this is a book that I'm definitely going to want to revisit, perhaps quite soon. 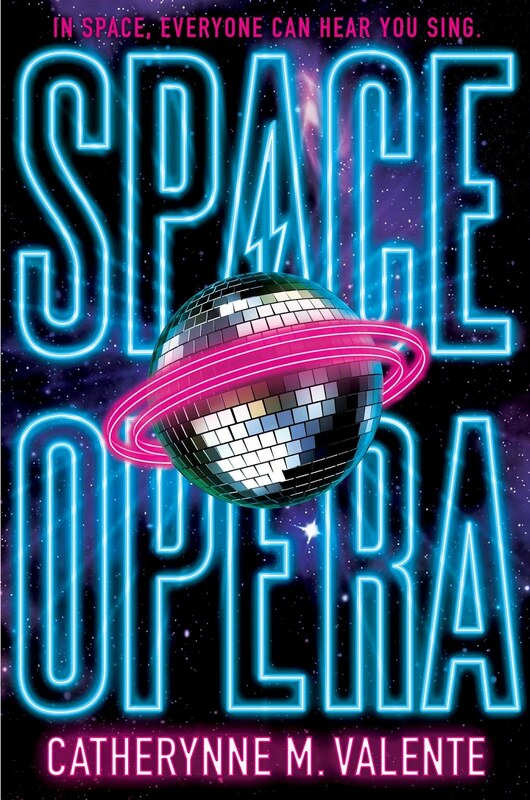 So, this story *is* kind of Eurovision in space but, then again, it's so much more, enough that it can be enjoyable for many different sorts of readers. It's definitely a commentary on current U.S. politics. It's also a celebration of diversity. And it's, most of all, a plea for all humans to improve our behavior and to prove our claim to sentience. Liberally peppered with angst and profanity, Valente's frustration with the current state of the world certainly came through and mirrored my own. What she has managed to do that I haven't though is to create a possible solution. Now, the chances of that solution--a performance by the earth's greatest living pop group at an intergalactic competition to try and prevent the human race from being destroyed--being in our future is probably quite slim but I appreciate her creativity. The real solution is probably going to be much more painful and require an effort from more than two people. In the meantime, we are only going to be kept sane by bonding together over things like smart and entertaining art. For now, I suggest we bond over this book. p.s. Valente got news a few days ago that it's going to become a movie! It's definitely worth trying because I find Valente to be different in each of her projects.